Historical wall art comes in many shapes, sizes and forms throughout the world and has helped shape and transform this art form. Disabled artists have played an important supporting role in this medium. However, no one knew until recently how fundamental disabled artists were in the origins of wall art. My blog for Brilliant Wall Art History of Wall Art, Part One - Cave Paintings, in 2015, highlighted early cave art beginnings. Wall art of this type can be traced back throughout the world to the Paleolithic Period. This was the earliest period of human development, lasting until approximately 8000 BC. Cave art discovered from all over the world features hand-prints outlined with ochre and other ancient pigments. 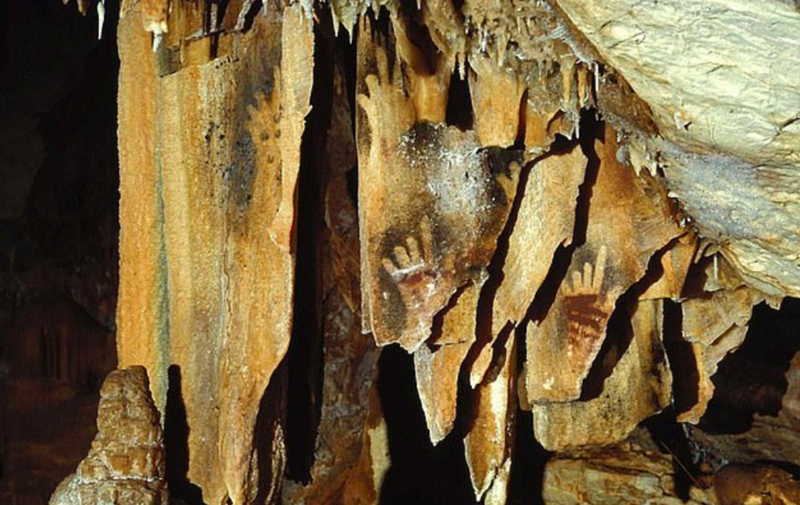 However, archaeologists and scientist have recently highlighted that images with missing fingers is very common in the appearance of cave art around the world in this period. Quite astounding really! A database including sites in Africa, Eurasia, Oceania, and the Americas detailed 121 separate cultural communities which exhibited the same convention. At the Grotte de Gargas in France, there are 231 hand stencils in total that belong to a group of up to 50 people. Almost 114 of these are missing one or more digits. Cave paintings suggest that Stone Age humans living in Europe may have ritualistically cut off their own fingers. These prints are regularly missing parts of fingers. Experts believe the widespread absence of the appendages is most likely because of gruesome religious rituals or sacrifice. Some scientists say the missing fingers may also be as a result of the harsh environment in prehistoric times such as frostbite. Other theories include ways of coping with grief or mourning, tribal combat, accidents and fierce wild animals are all other potential causes for the loss of the phalanges. Mariusz Konrad Kędzierski is a Polish artist born without arms. He was born and lives in Świdnica. His talent was discovered when he was just 3. He was drawing and painting up to the age of 12 when he had to stop for a few years, but after one of his surgeries at the end of 2008, he started again. From that time he continues his art, most of which are portraits. His drawings are sold in many countries, from the USA, Great Britain to South Korea. Paul Smith was an American artist born with cerebral palsy. The loss of fine motor control of his face and hands made it impossible for him to attend school - or even eat, clothe, or bathe himself - and also made it difficult for him to express himself. However, early in his life, Paul discovered the typewriter and a technique for using it with only one finger to create truly amazing pictures. Peter Longstaff was born without arms after his mother took thalidomide, a drug prescribed for pregnant women with morning sickness in the late fifties and early sixties which resulted in their children being born with deformities. Despite having no arms, Peter learnt to use his right foot like his right hand and this sense of independence helped him to develop his skills as an artist. He is a member of the Mouth And Foot Painting Artists' (MFPA) group and has exhibited at the Royal College Of Art in London. Doug Landis was not an artist until he broke my neck in a high school wrestling match and was paralyzed from the neck down. Being a quadriplegic, He taught himself to draw and paint by mouth. To overcome his limited reach, he learned to draw upside down and sideways to create the intricate detail that’s become his unique style. He is inspired by the beauty of wildlife. The way that these artists have triumphed over their physical disability, to articulate their art form, is poignant and emotive. These artists are truly inspirational. The beauty of animals and wildlife is highlighted in the metal wall art on display at Brilliant Wall Art. Brilliant Wall Art is the Midlands premier wall art, home and garden accessory specialist. Based in Birmingham, Brilliant Wall Art have been providing decorative metal wall art and home accessories since 2006 with our primary goal being customer satisfaction. "Provide an extensive range of contemporary and quality decorative metal wall art and home accessories at the lowest possible prices". Our metal wall art is certainly not cave art. 1. 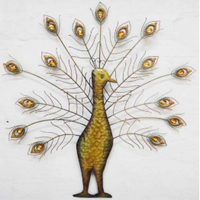 Jewel peacock fan spray metal wall art, with twinkling acrylic gem style detail. It has a hand painted finish in a colourful bird design. 2. This abstract heron with head facing up is a contemporary and elegant design. Sitting in brown coloured reeds, the heron’s body is a silver-white colour that contrasts well with its blue wings. 3. Teal yellow gecko lizard, metal and glass wall art is an unusual and colourful design. It is constructed from a metal frame that holds the central glass panel, has a hand painted finish featuring glass eye detail. Why not visit Brilliant Wall Art at the Worcester City Centre market every Saturday? You will be able to view and examine the quality wall art and home décor on display.